They say, one rotten apple spoils the whole basket. If you are an instructional designer, you are probably nodding your head in agreement. Someone somewhere churns out a few trashy courses and manages to shoo away learners and business owners. Business owners take one look at these and decide they don't want to commission another one ever while learners doze off midway through the course and decide they won't waste their valuable time any more. 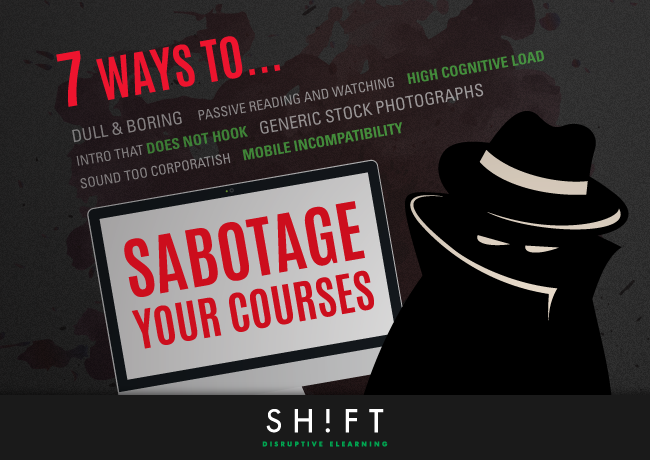 So what does it take to create a bad eLearning course? Are the pitfalls too many? And most importantly, how do you ensure you don't create a bad course yourself? The biggest sin you can commit as an instructional designer is to dish out dull and boring content in the name of learning! Dull and boring courses are easy to spot—they bring out the yawns. They are courses that dump information on the learner without caring if he or she can make sense of it. They are courses that talk down to the learner instead of talking to him or her. They are courses that contain dull information, cold statistics, and dry facts, but no heart. Write in an informal, conversational tone because this is how your learners talk. Tickle their emotions. Your corporate learners have had enough of sitting through cold and heartless training sessions and being made to gulp down soulless numbers and charts. If you really want your course to resonate with them, touch their hearts. Throw in an element of surprise to keep your learners hooked. Stick with the facts but weave a story around them. Creating eLearning with these 5 Story Elements. Add Variety. Success stories, real-life examples, and case studies are other types of content that are not only easy to absorb but also a lot more personal than the typical wordy screens. Why do you think we don't remember most of what we learned in high school? Or why do you think we remember what we learn on the job? The answer is in the level of engagement of these training sessions. How did you learn in school? You sat through a lecture and listened to a bucketload of information dumped on you. You came back home and burned the midnight oil to cram in pages from books. Passive learning neither aids retention nor helps application. On the job, you get to learn by doing. Experiential learning is always the best method to imbibe learning that you can apply. Grab the learner's attention by inviting him to solve a problem. Your application- and results-oriented corporate learners will be hooked immediately. Add a game. Games are not only engaging but also provide ample opportunities for you to create realistic environments that the learners can explore and interact with. Chunk content smartly to filter out irrelevant information. Retain information that aligns with the learning outcomes. Keep on-screen text to a minimum. Users today are not too fond of going through large blocks of densely-packed text; most read only 28 percent of the words in a Webpage. Although we are visual creatures and images are worth a thousand words, it never makes sense to pack in too many images in the course. Especially not if your intention is to use the images to cover up for boring content. Try to include job aids in your eLearning courses.They are an excellent opportunity to include important content in an easy to digest format. First impressions linger. In eLearning, first impressions can make or break the chances of your course keeping the learners hooked. The intro is where you have to give your best shot to grab eyeballs, rivet attention, and assure learners there is value in your course. Present a surprising piece of statistic or an intriguing fact to capture learner attention. Present a real-life problem that your learners are grappling with and tell them you have the solution. Present the story of how an ordinary man, who is like the learner in many ways, overcomes his obstacles to become a hero. We all love stories, and be assured, your learners will want to read on to know how they can emulate the hero. Use a catchy headline. Learners will use the headline to determine the relevance of your course, so it needs to be attractive enough to spark initial interest. A group of smiling people staring at the computer monitor in their office. A young woman biting into an apple. A doctor or a fireman holding his thumb up and smiling at you. Do these images get you excited? Do you feel like you want to know the person in the photograph and learn his story? These stock photographs don't touch you because they are generic images. So why do you expect these clichéd images will keep your learners hooked to your course? Make the effort to add photographs that show real people in real-life situations exhibiting believable emotions. Make sure that your images are relevant to your content – otherwise, you’re just wasting your time. Choose images that are fun and engaging, and move the content along. Personalize and make your stock photos unique. Here's how. Nothing shouts apathy and indifference like the heartless, pompous tone of the corporatese. Nothing more is as repulsive as text that might have been uttered by a robot that has no clue of how you feel and is only programmed to carry out certain mechanical tasks. Steer clear of long, winding sentences. Write short, crisp sentences that are no more than 14 words long. Throw in a couple of one-word sentences or three-word paragraphs to add a conversational tone. Ditch the passive voice. A passage written in the active voice is inspiring and establishes you as an authority, someone who knows what he is talking about or is going to do. Use simple words. You may have a large vocabulary, but don't make your learners reach out for the thesaurus when they are grappling with difficult technical concepts or are attempting a challenging simulation activity. Download this free eBook to grab more tips on how to write engagingly. The BYOD (Bring Your Own Device) movement is about to become the norm in most workplaces, and mobile learning is already on the rise. So you have to ensure that your courses are compatible with a large array of mobile devices. Else you risk losing your learners who won't bother to chase your course if they can't access it on their personal mobile devices. The line between creating a course that is a riveting page-turner and one that falls flat on its face is sometimes blurred. Above are some pointers, and at other times, you will have to rely on your instinct and knowledge of your audience. Bullets in eLearning: Friend or Foe?